Acute bronchitis affects approximately 5 percent of all adults, prompting almost all of them to see their doctors, according to an article in "Canadian Family Physician." This condition is characterized by a persistent and productive cough caused by infection of the bronchial tract. Although there is no test that can confirm an acute bronchitis diagnosis, it is usually confirmed when pneumonia has been ruled out. Coffee contains caffeine, a bronchodilator that has effects similar to prescription medications used to treat breathing difficulty caused by bronchitis. Prescription bronchodilators, like albuterol, may be prescribed to improve lung functioning in people with acute bronchitis, according to the American Academy of Family Physicians. Caffeine also acts as a bronchodilator, according to Nancy Lowry, professor of chemistry at Hampshire College. Caffeine is sometimes used to treat the bronchial constriction that occurs in people with asthma. Similarly, the bronchial tubes may become swollen and inflamed during an acute bronchitis episode. Because both coffee and some prescription and over-the-counter bronchodilators are stimulants, use caution when combining them. Adverse effects of a combination of stimulants can include anxiety, insomnia and panic attacks. Although the caffeine in coffee may have bronchodilating effects, prescription bronchodilators, particularly inhalers, reach your lungs immediately. In contrast the caffeine in coffee must travel through your digestive system before entering your bloodstream. In addition, FamilyDoctor explains that it's important for acute bronchitis sufferers to remain hydrated to help maintain a productive cough. It recommends drinking water and juices and not caffeinated beverages like coffee, which can have a mild diuretic effect. Antibiotics and bronchodilators are generally prescribed to treat acute bronchitis, reports the "New England Journal of Medicine." 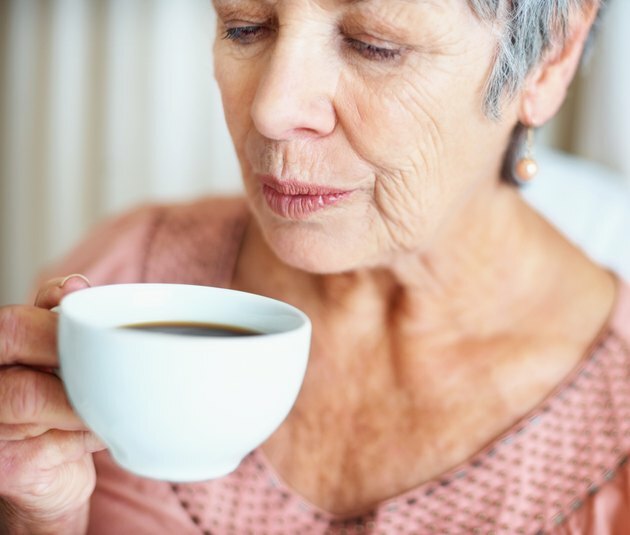 Consuming coffee while also using a bronchodilator may also decrease the effectiveness of the medications, explains an article in "Clinical Pharmokinetics." The combination of stimulant effects from bronchodilators and caffeine can lead to symptoms including seizures and confusion. Excessive consumption of stimulants can also cause cardiac problems such as an irregular heartbeat. Getting enough rest is essential for recovery from acute bronchitis. If you have this condition, reducing or avoiding coffee can improve the duration and quality of your sleep so your body can heal. In some cases, explains FamilyDoctor, individuals with acute bronchitis may develop constriction of the airways that causes wheezing similar to the type that occurs with asthma. Smoking, which is also a stimulant, can make this wheezing worse, impair sleep and interact with coffee to increase stimulation. Are Coffee & Tea Good for Asthma & Bronchitis?